The U. S. has made dollar coins since 1794. Until 1935 they were made from an alloy containing mostly silver. Early silver dollars of the Bust and Seated Liberty design are very scarce. Only Morgan Dollars and Peace Dollars are plentiful. Morgan Dollars, named after the designer George Morgan, are dated between 1878-1921. Peace Dollars, commemorating of the end of World War I, are dated from 1921-1935. 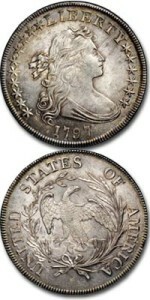 Though different designs, both types portray a Liberty Head on the dated side and Eagle on the other. An interesting design element of the Peace Dollar is the use of the roman “U” in the word “Trust” which looks like a “V”. 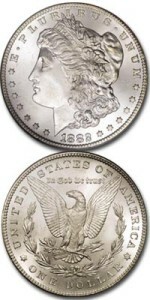 The mintmark on a Morgan Dollar can be found on the reverse just below the wreath. On a Peace Dollar the mintmark is on the reverse just below the O in the word ONE. Both types of dollars are very common and the average coin found by the public is worth around $12-20. In the Morgan series the rarer dates include the 1885-CC, worth about $400, the 1889-CC, worth about $500, the 1893-S, valued at $3000+, and the 1895, worth $20,000+. In the Peace series, the scarcest dates are the 1921, worth about $80 and the 1928, worth $275. Perfect uncirculated examples of either type can be worth considerably more. If your dollar coin is dated from 1971 through 1978, it is an Eisenhower Dollar. The small dollar made from 1979 through 1981 is called the SBA dollar after the portrait of Susan B. Anthony on the coin. Both designs are made from a copper and nickel alloy and are worth only face value. 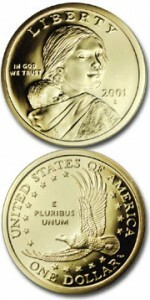 In 2000, the Sacagawea “Golden Dollar” was issued as a replacement for the unpopular Susan B. Anthony dollar. The Sacagawea coin depicts the young Shoshone woman with her infant son slung on her back. The coin is composed of a pure copper core clad with layers of metallurgically bonded manganese brass. It weighs 8.1 grams and has a diameter of 26.5 mm. 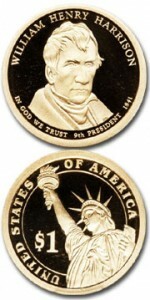 Beginning in 2007, the U.S. Mint began production of the Presidential Dollar coin series. Made of the same composition as the Sacagewea dollar, the Presidential dollars have one important difference – the coins have a lettered edge instead of the plain edge used on the Sacagewea dollar or the reeded edge of the Susan B. Anthony and earlier dollar coins. The Presidential Dollars will be issued at the rate of four per year until all of the U.S. Presidents have been featured, currently expected to be the year 2016.